[170 Pages Report] The overall market size of biochips is estimated to grow at a CAGR of 18.4% from 2015 to 2020 to reach $17.75 billion by 2020. The base year considered for the study is 2015 and the forecast for the market size is provided for the period between 2015 and 2020. In the current market scenario, biochips are increasingly adopted in various applications in the field of genomics, drug discovery, and proteomics. In addition, the development of targeted and personalized medicines for the treatment of cancer and technological advancements in biochips are also supporting the growth of biochip products. 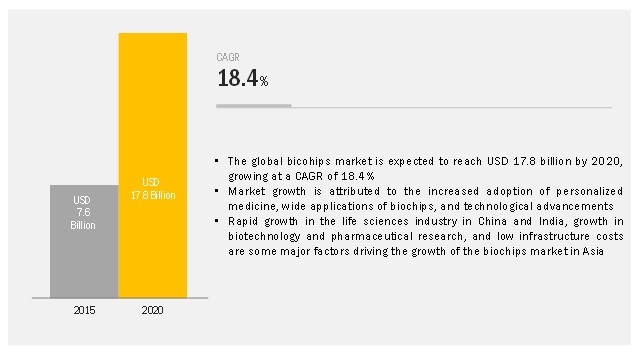 The objective of Market report is to define, describe, and forecast the global market of biochips on the basis of type, applications, end user, and region. It provides detailed information regarding the major factors influencing the growth of overall market. Drivers, restraints, opportunities, challenges, and trends in the market have also been taken into consideration while preparing this report. This report also tracks and analyzes competitive developments of the key players in market in terms of market developments, product portfolios, and key financials. Top-down and bottom-up approaches were used to validate the size of the global market and estimate the size of various other dependent submarkets. The fabrication technology markets for all segments were determined through secondary research and were added up to obtain the global market value. Secondary research included the study of the annual and financial reports of top market players, whereas primary research included extensive interviews with the key opinion leaders such as CEOs, directors, and marketing executives. The percentage splits, shares, and breakdowns of the product markets were determined using secondary sources and verified through primary sources. This data is consolidated and added to detailed inputs and analysis from MarketsandMarkets and presented in this report. Some of the secondary resources we referred are U.S. Food and Drug Administration, Journal of Biochips & Tissue Chips, American Medical Association (AMA), National Cancer Institute, Journal of Molecular Diagnostic and The World Bank. By technology the microfluidics segment is expected to be the faster growing in the biochips market during the forecast period. By end user, the hospitals & diagnostic centers segment is growing at the highest rate. 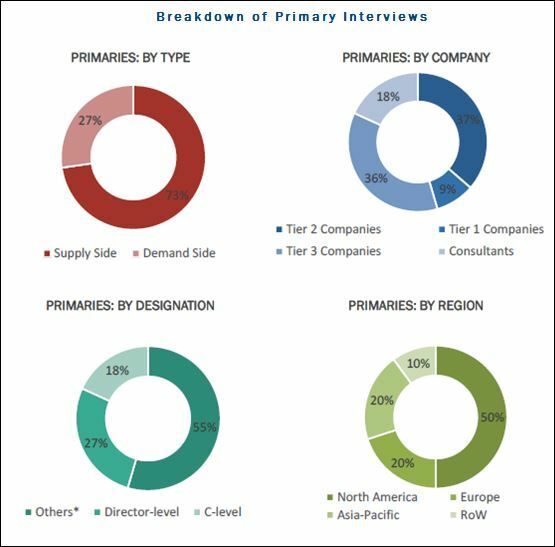 Key players in the biochips market include Abbott Laboratories (US), Agilent Technologies, Inc. (US), PerkinElmer Inc. (US), Fluidigm Corporation (US), Illumina, Inc. (US), GE Healthcare (US), Bio-Rad Laboratories Inc. (US), Cepheid Inc. (US), Thermo Fisher Scientific, Inc. (US), and F. Hoffmann-La Roche AG (Switzerland). In 2016, Thermo Fisher Scientific Inc. completed the acquisition of Affymetrix Inc., a leading provider of cellular and genetic analysis products. This acquisition helped Thermo Fisher to strengthen its leadership in biosciences, as well as acquire new genetic analysis capabilities to better serve clinical and applied markets. In 2015, Affymetrix (US) and Cytox (UK), an innovative developer of assays for risk assessment and prediction of dementia, formed a strategic partnership to develop and commercialize blood-based genetic assay for Alzheimer’s disease risk assessment. This partnership helped the company extend its offering to the dementia research market. 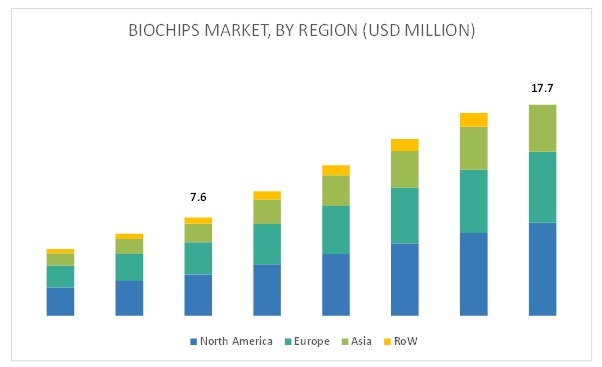 Who are the major market players in the biochips market? What are the regional growth trends and the largest revenue-generating regions for biochips market? What are the major drivers and challenges in the biochips market? What are the major product segments in the biochipa market? 11.10 Thermo Fisher Scientific, Inc.